When creating a new world, I always consider it a good starting point to look at already existing settings that you like and consider to be almost perfect. You shouldn’t try to use everything you like from these settings, or you’ll likely end up with a generic kitchen sink setting, but it can help you a great deal in understanding what kind of world you want to make. 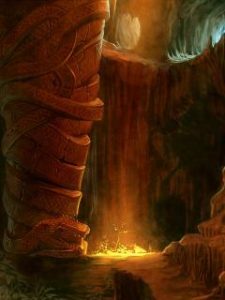 In the case of the Ancient Lands, my primary inspirations where the stories of Conan of Cimmeria and Geralt of Rivia, the High Forest and Icewind Dale of the Forgotten Realms, Dark Sun, Skyrim, Dragon Age, and even some elements from the universes of Star Wars and Mass Effect. Even if you know just a few of these sources, it becomes clear that this setting will be about rough guys with good hearts who solves problems with both the sword and quick thinking and whose adventures will lead them to remote corners of the world rather than the palaces of kings or at the head of large armies. As of now, the Ancient Lands setting is primarily a collection of pieces and themes from which an actual world can be assembled. Races, environments, creatures, magic, deities, and cultures are already developed in quite some detail, but there aren’t a nailed down geography, history, settlements, and dungeons yet. I got all the props together which I will need, now the next part is to put them all together into an actual world to be explored. This article is just a brief summary of the Ancient Lands setting, but I hope that the following list can provide a good basic overview for the world that will take a more defined shape in the comming months and perhaps years. A Bronze/Iron Age world, in which humans have not yet become the dominant race and most of the land is still wild and unsettled. There are three primary geographic regions. A northern part based on the landscape of Scandinavia and Canada; a central part roughly based on the Mediterranean, Black Sea, and China; and a southern part inspired by Vietnam and the Amazon. A moderate level of magic, with spellcasters being reasonably common in the form of shamans in almost every village, but with relatively subdued magic spells and items and characters only up to 10th level. The otherness and danger of the spiritworld and its inhabitants recieve significant attention, with superstitions and reverance of spirits being a common element relevant to the stories. Culturally, it’s a blend of Northern Europe and East Asia, without trying to imitate either. Player Characters are generally expected to be important members of their local society who defend their clan and ultimately serve their chief or king in some way. Combat is treated as non-trivial, and even though it is not meant to be a highly lethal world, armed fighting should not be treated as filler and entered lightly. Conflicts focus much more on survival than ideology, and PCs should frequently get into situations where it would be a good idea to make compromises with terrible people and withdraw from battles that are not your own. Most importantly, I see the Ancient Lands as the kind of setting that someone else should have made long ago, but with nothing that is out there really fitting my wishes, I’ll have to be the one to step forward to fill that void. If I can bring it all into a shape that will also make other people consider using my world in full or as parts, that’s an added bonus. Though admitedly a big one. However, I am doing all this as l’art pour l’art and not a comercial enterprise. Entertaining an audience comes before profits and all releases both for the Ancient Lands and under the Spriggan’s Den label will always be available as plain pdfs for free. Definitely an interesting approach. Outside of a lot of magic utopian settings, most fantasy takes place in a world that has already fallen and is long past its golden age. Hence, we have lots of ruins and abandoned places to explore. But sometimes one has to wonder if those places were not more fascinating in their hey-day. What was the ruined temple like when people were still living on the grounds, worshiping there, and going about their daily lives? What was the cursed tomb like when it was a regular tomb, where people interred their loved ones and groundskeepers tended to the graves?